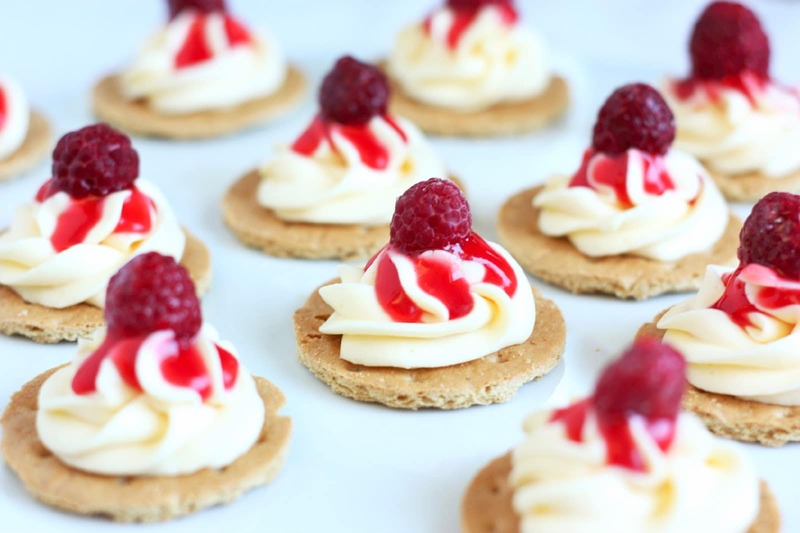 Mini cheesecake desserts in 15 minutes, yes please! This is one of those uh oh recipes for me =). 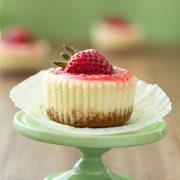 I created it because if you haven’t noticed I LOVE cheesecake and I wanted a simpler, ready to enjoy sooner cheesecake recipe. Yes those New York style cheesecakes are utterly amazing but sometimes I just can’t wait for it to bake and hour then chill eight hours to dive in and enjoy it. These are ready to eat in about 15 minutes! Hence why I said this is an uh oh recipe for me. They are dangerously delicious and so incredibly simple to make. I’m sure I will be making them a bit too often. These would be so fun for parties. 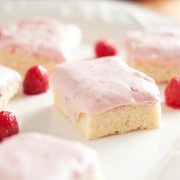 I know I will be making them for July 4th using raspberry jam and garnishing them with blueberries. This recipe is so versatile, you can switch up the pudding flavor (I want to try white chocolate and chocolate next). You can use your favorite type of jam/berry syrup or even omit it and just use berries. You could drizzle with caramel ice cream topping or melted chocolate rather than using jam and garnish it with chocolate slivers. You could even do an Oreo cheesecake version by adding crushed Oreos to the cheesecake mixture and then garnishing them with a mini Oreo (you could even use a regular size Oreo in place of the graham cracker). 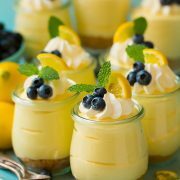 You could do a lemon or lime version by adding in a little bit of lemon/lime zest and juice to the pudding and garnishing them with mini lemon/lime wedges. I would like to try a Nutella version sometime too. You see what I mean there are endless possibilities, so have fun and create your own version. Enjoy! Unprofessional I know, all I had on hand was frozen berries but I wanted you to have an idea at least of what they look like with the berries. Fresh would be best if you have them. The easiest cheesecake treats you'll ever make! In a large mixing bowl, using an electric mixer, whip together cream cheese, powdered sugar and vanilla until smooth, about 1 minute. Using a wire whisk, stir in cream, milk and instant pudding. Whisk mixture for about 2 - 3 minutes (by hand) until very thick. 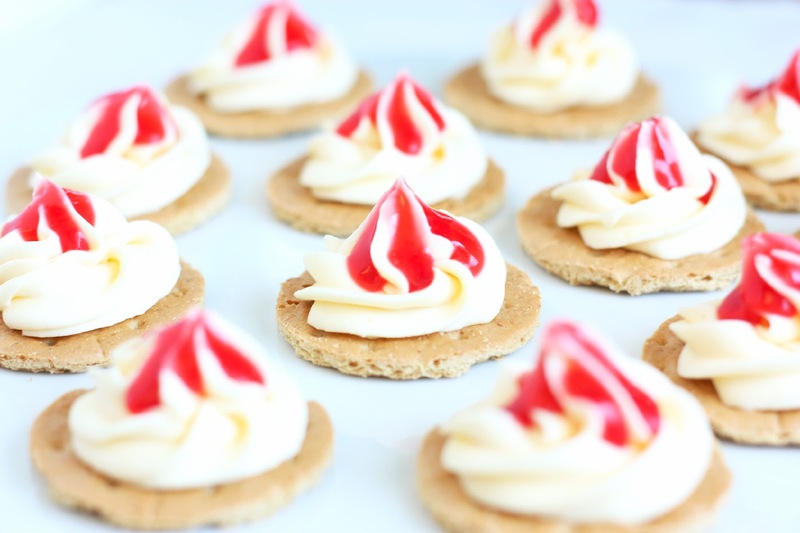 Place mixture in the freezer for 5 - 10 minutes while you prepare the graham cracker circles. 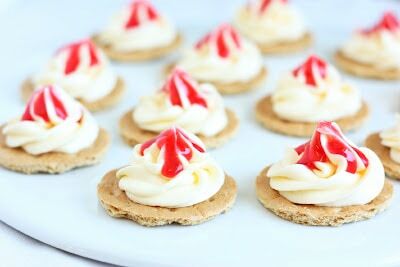 Break graham cracker sheets into halves, then using a metal 2 1/4" circle cookie cutter or fondant cutter, cut crackers into circles. Remove cheesecake mixture from freezer and using a large spoon stir until nearly smooth (to remove the little lumps), about 30 seconds. Pipe cheesecake mixture over graham cracker circles, drizzle with seedless jam and top with optional berries. Store in the refrigerator (note: for best results drizzle jam just before serving). *see post above for additional drizzling and topping ideas.